If you can’t save money, forget about retiring on time. Sadly, you might have a hard time retiring, period. We all know this is true, of course, but that doesn’t necessarily make it any easier to save for this important stage in our lives. Fortunately, technology has caught up with this challenge. If you need help saving money for retirement, we’re about to show you the four best apps for doing so. They’ll help take a lot of the work and discipline out of setting money aside so you’re covered during your golden years. The great thing about Mint is that you can use it to track all of your financial accounts and all the activities that go along with them. This can be especially helpful for those of you in relationships with joint checking accounts. Now you and your partner can keep each other accountable for your retirement goals. While that’s important, Mint also has a great reputation amongst people who need help saving money because it actually creates a budget for you based on your spending habits. This takes so much of the legwork out of such an important tool for retiring on time. It will even make adjustments to your budget as time goes on. Mint has all kinds of ancillary features that make it helpful, as well. For example, you can use it to quickly check your credit score. Speaking of the all-important budget, You Need a Budget has received high marks for making this task extremely simply. For one thing, it’s incredibly user-friendly, yet it doesn’t lack for capabilities. The way it works is that YNAB makes you assign a responsibility to every dollar. This is an obvious way to cover your bills and not overspend, but most of us could still use some help. YNAB is really good about using this component to ensure you’re only living off of last month’s paycheck and not overextending your budget. I hesitate to include an app on this list that supports spending, but it’s not as though we can simply focus on saving for retirement and nothing else. Therefore, when you do need to spend money, use Shopkick. This app will show you what kinds of deals are available at stores like Best Buy, Target and Macy’s. Furthermore, it will give you points for purchases, referring friends and even small things like making the trip on foot (which will save you gas money). These points can then be redeemed for gift cards at those stores. Please make sure you use these apps responsibly, though. I’d recommend keeping a list of the things you actually need and then luxury items you’re saving up for. When you use this app, cross-reference that list. The point is that you should snag a deal on something you actually don’t need or only want because it’s on sale. Note: Most grocery stores now have their own apps, too. Check to see if the one you frequent offers one and you should have no problem saving even more money. It’s sometimes very easy to become overconfident with our bank accounts. Have you ever made a purchase and, in the heat of the moment, you were sure it was something you could make the payments on? PocketGuard sits on your phone as a constant reminder of how much is actually in your bank account at that moment and how much you’ve already spent. This app is great for saving for retirement, but I also like it for pre-retirement and retirement purposes, too. Having this data staring back at you throughout the day will help you stay loyal to your budget no matter what phase of your life you’re in. Any of the apps above are going to help you with retiring on time and, importantly, none of them are going to break the bank, so be sure to try out all four. However, you’ll notice that the apps we covered don’t actually handle the most important part: investing. Without a doubt, using these apps for help saving money is important, but unless you’re putting those funds to good use, you’re no closer to retiring on time. Saving for retirement implies investing that money wisely. This is where Mooney Lyons comes in. 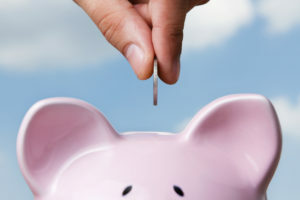 If you would like help saving money or investing it wisely so it’s waiting for you when you retire, contact us today. We can create a custom plan based on your current financial situation and what you’ll need for retirement. Our staff is always available to answer any questions you may have, as well. The applications listed are not affiliated with, nor endorsed by, LPL Financial.